The Universal Waypoint Converter is a small software application that helps you to convert waypoints and routes from the proprietary Adrena format (.wp and .rt) files to the open standard GPS Exchange Format (.gpx). 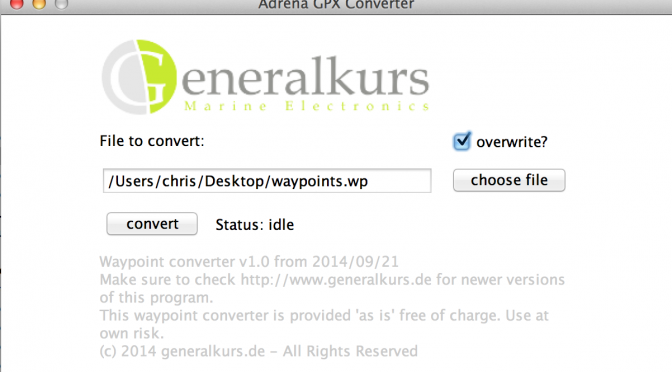 The waypoint converter can currently convert only from the Adrena format to the .gpx format. A helpful utility when you want to exchange GPS waypoints and routes between users of Adrena, Expedition, MaxSea, etc. or you want to upload waypoints into your GPS using a software that supports the gpx format only.